Published by Joshua Clare-Flagg on 30 Apr, 2013. 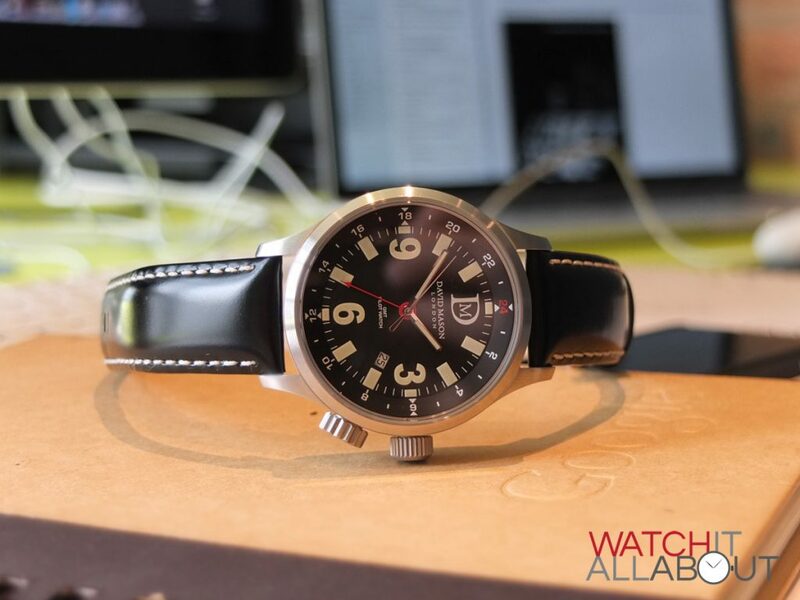 The case is a nice large size, at 46mm. It is 56mm lug to lug and 12mm thick. 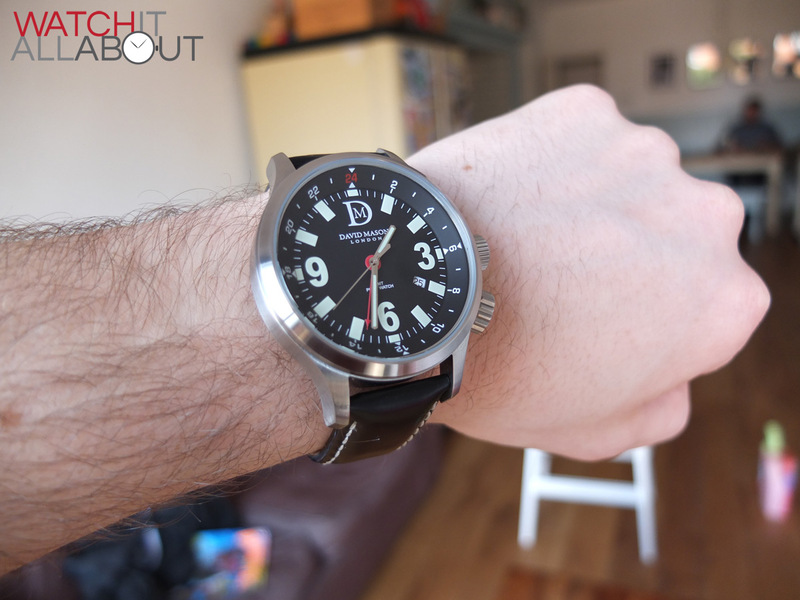 This is a good hefty size, but does not feel rediculously huge on the wrist, which is good. 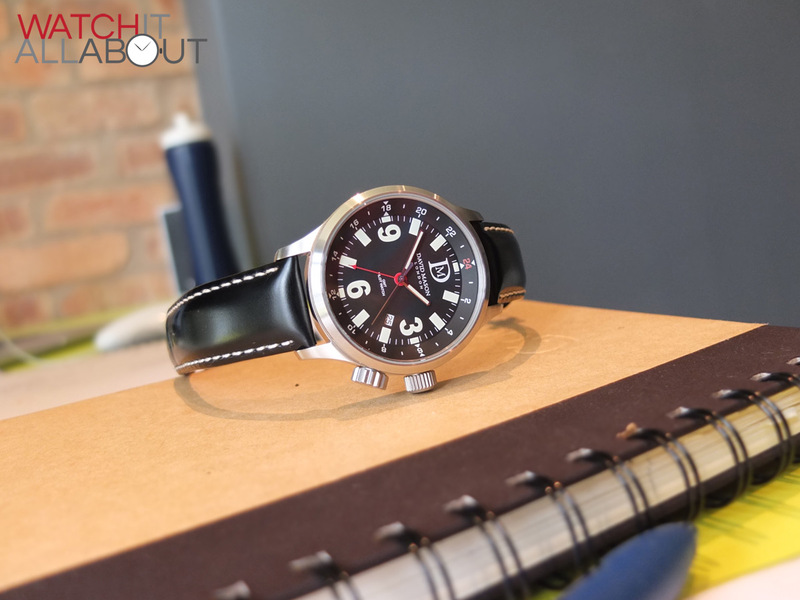 It is nice and light for the size, aided by the fact that it has a quartz movement rather than an automatic. The one real let down of this watch is that it has a mineral crystal. Albeit extremely clear (check out the pics) and a nice large size, it always worries me as they are prone to scratching if you knock them. A sapphire crystal would have been much better, but with the crystal being this size, it probably would be quite expensive. But, at £160 new, I really would expect to have a sapphire crystal. The finishing of the case well executed. It is completely brushed stainless steel. The case back has nice detailing and decent etching. 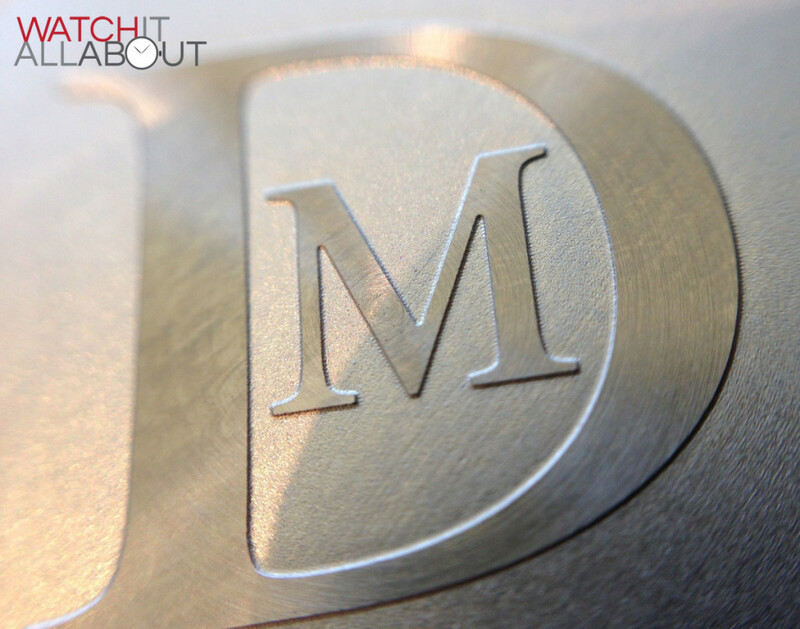 It has a large DM logo in the centre with various pieces of information around the outside. The screw in crown has the DM logo etched into it and has good grip. The etching on it isn’t that deep though. The threading is solid and has a good amount of threads. 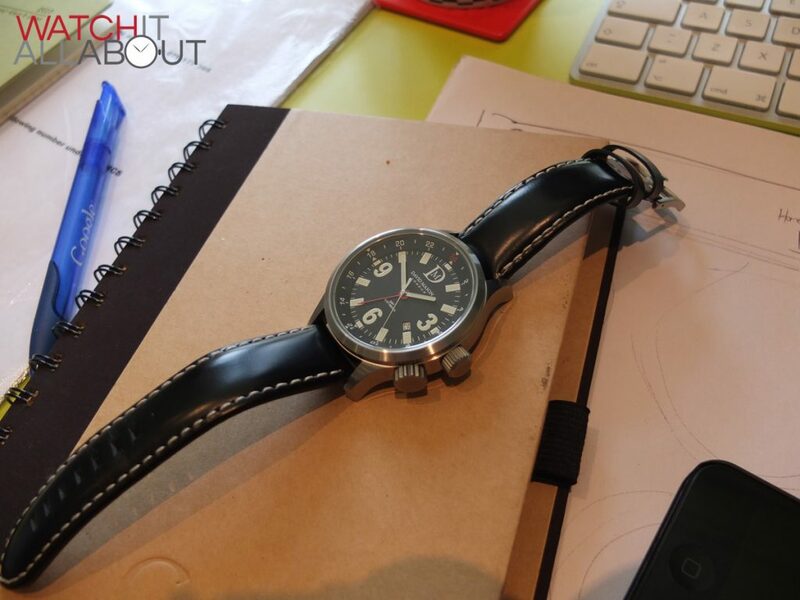 The internal bezel crown is very nice too, with large grip and at a large size it gives the whole feel of the watch a more tactical and tool-like feel to it. This is not a screw in crown. 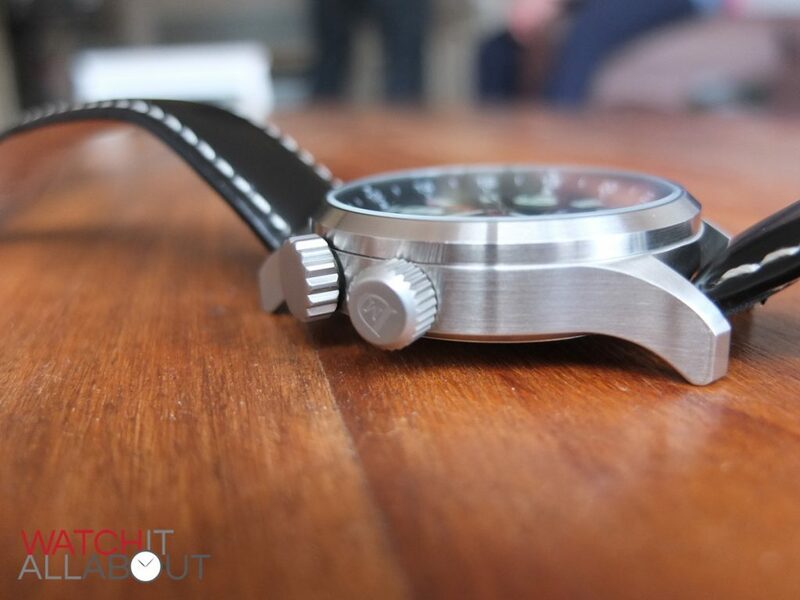 Rather, you can just turn it in either direction to move the internal bezel. Both of the crowns are a more matt finish, rather than brushed. They both look great and feel high quality in the hand when you are turning them. 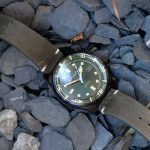 The watch has a lovely deep black dial. 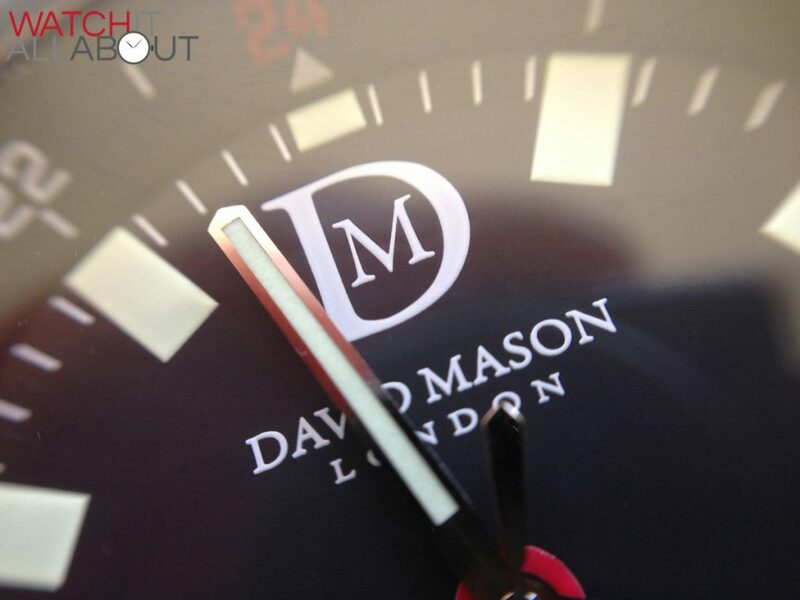 It has the DM Logo at the top with David Mason London printed just below it. 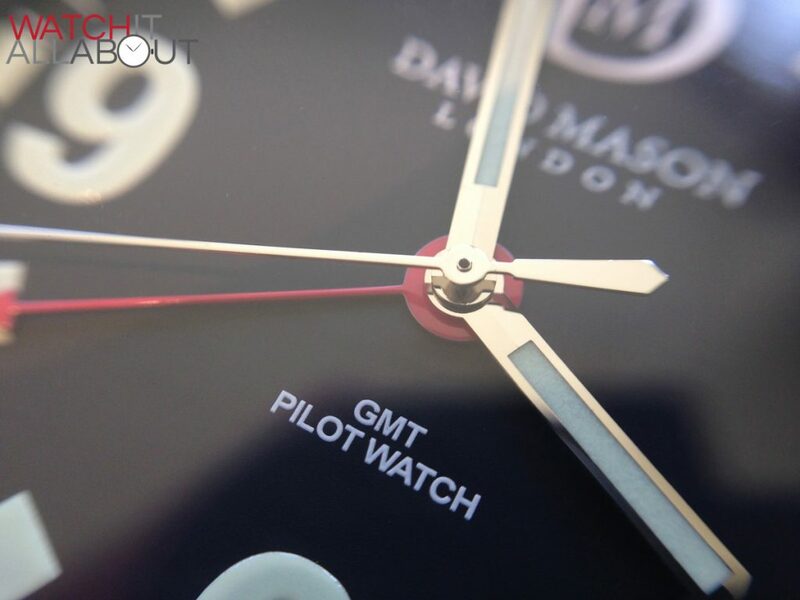 It also has GMT PILOT WATCH printed in the lower half of the dial. All of the printing is flawless. It seems to be quite good quality ink too as all of the printing is nice and thick – it all has a nice bevel on it. 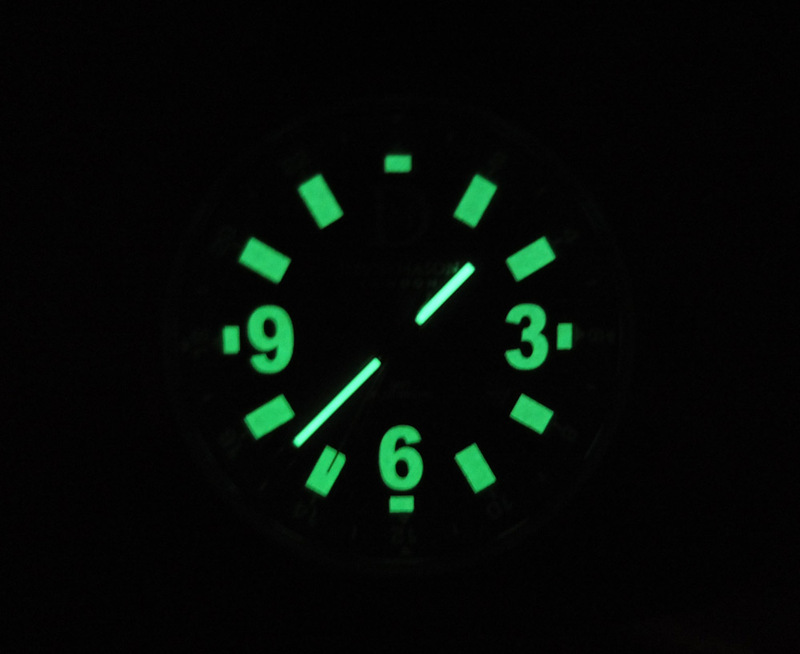 The lume on this watch is great! Much better than any Christopher Ward I have held. There are oversized square or rectangular hour markers, as well as an oversized 3, 6 and 9. They are all lumed very well and are very neat. 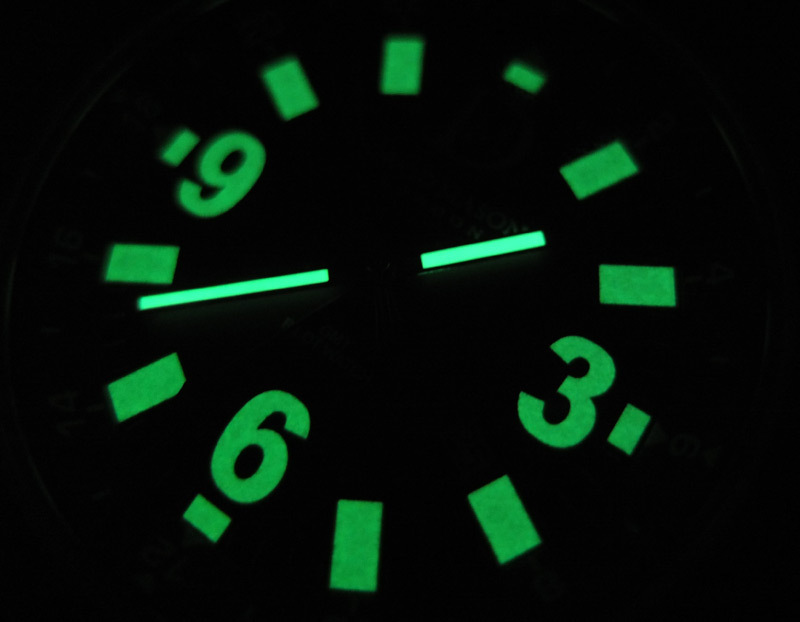 The lume application is extremely even, even across the larger areas. The red GMT hand gives the whole watch its main splashing of colour. 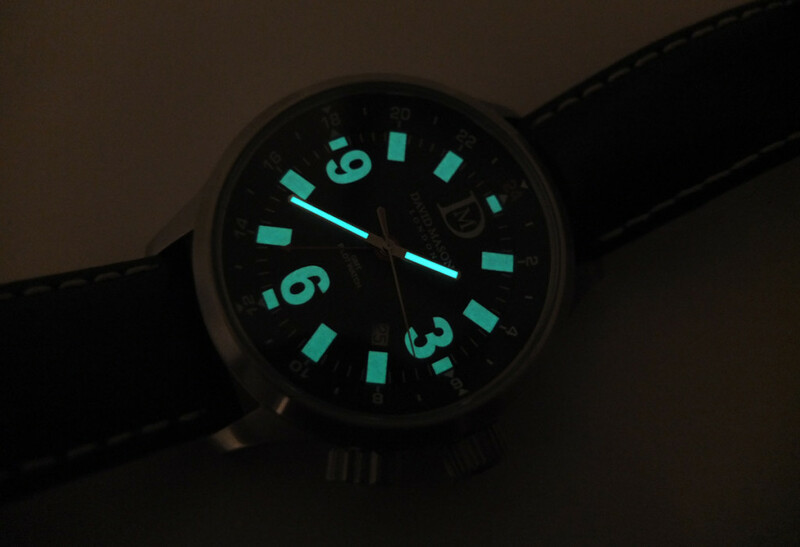 It has a nice large base which increases its visibility and also increase the amount of colour in the dial. It has a pointy arrow at tip, almost reminiscent of the Red Arrows, keeping with the aviation theme. 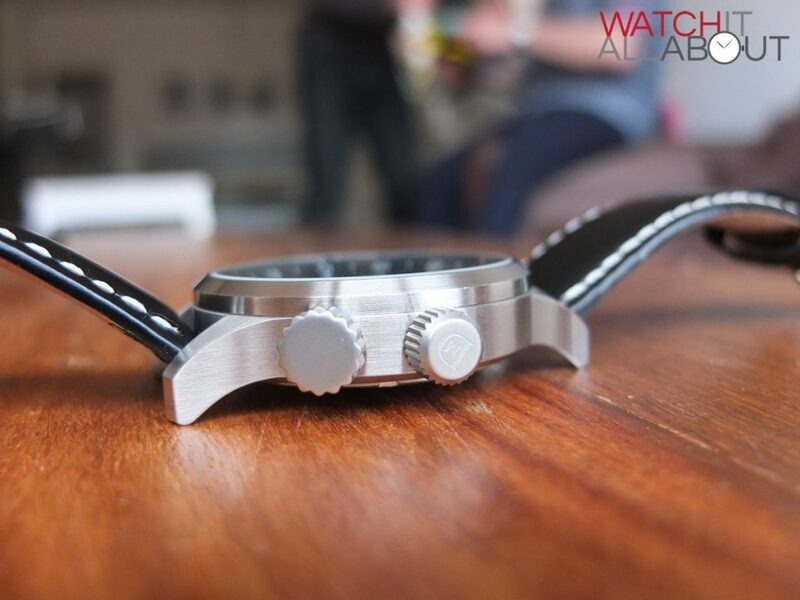 The inner bezel rotates nicely, and the gearing behind it have a high quality feel. It has markings every 5 mins (2 hour increments). 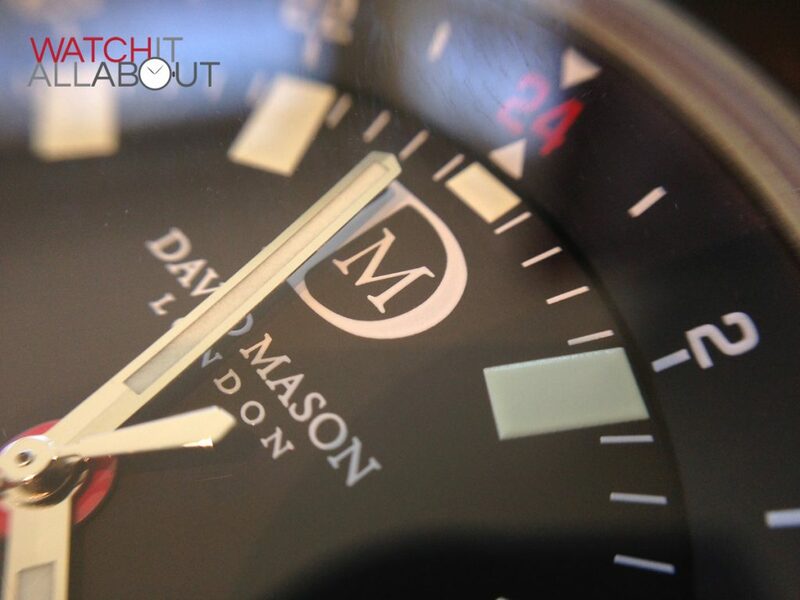 The red of the GMT hand is followed through at the 12 position (24H), with the number in the same colour. The hour and minute hands are batons with small arrows on the end. They have lumed centres – which is again well applied. The seconds hand is a thin polished steel hand which has an arrow as the counterbalance. The date wheel is white with a professional thin black font. 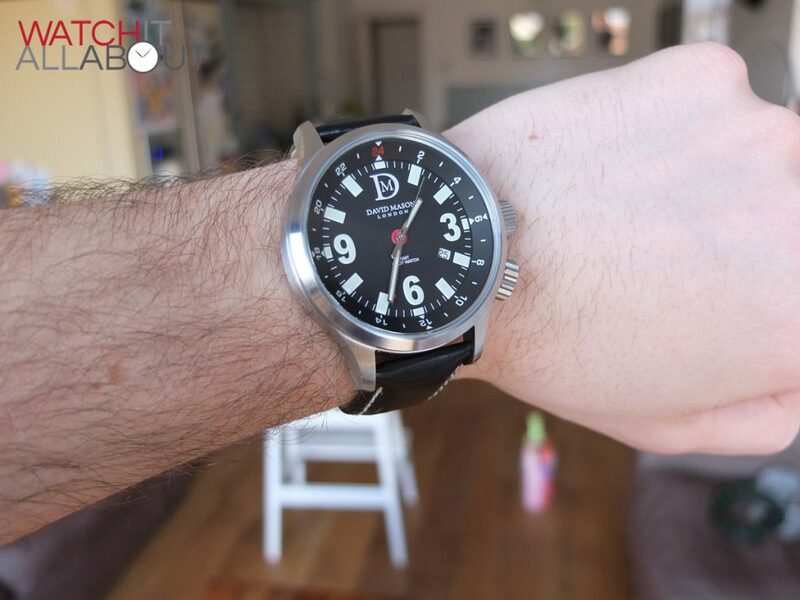 The DM1b has a Swiss made Ronda 515 Quartz movement with true GMT functionality. 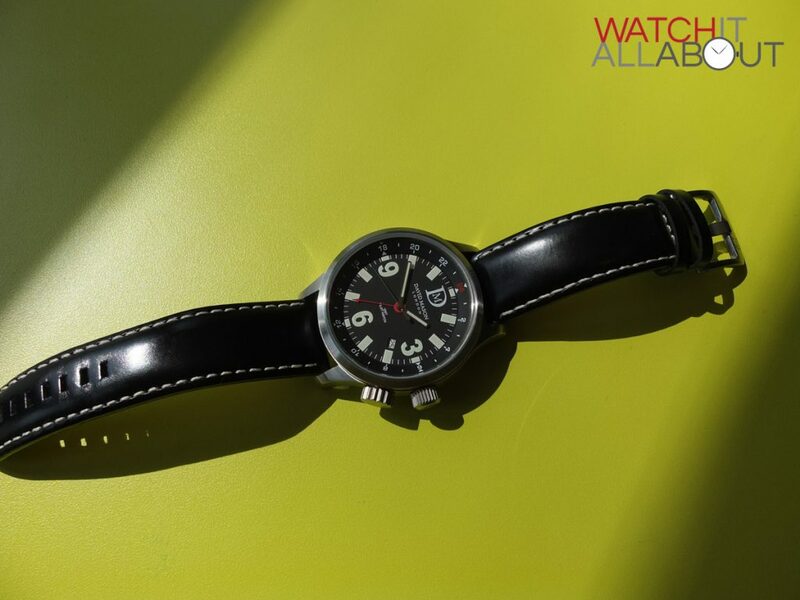 When it says true GMT functionality, what it means is that the red hand acts as a 24 hour hand, which goes around dependant on the time the watch currently shows. 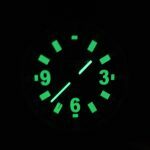 The different time zone can then be displayed by rotating the internal bezel and seeing what time the arrow points at. 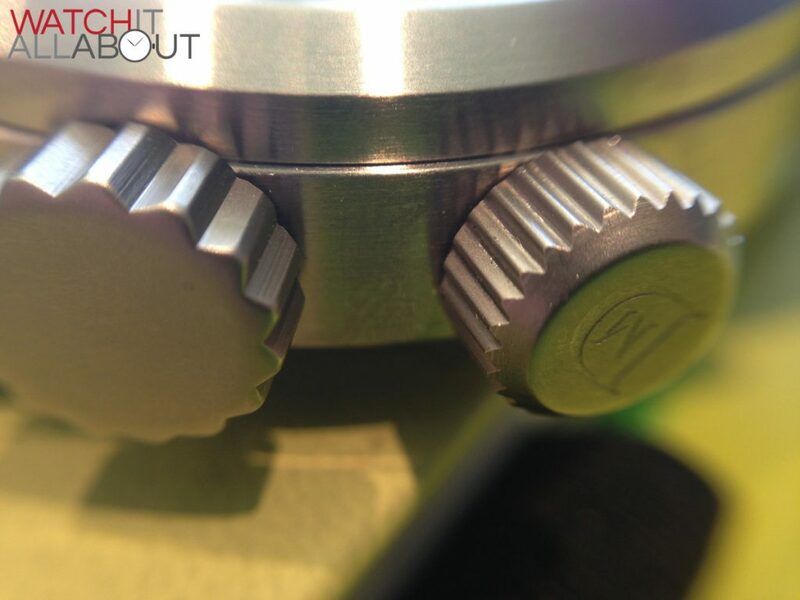 The movement has a 45 month battery life with just 1 jewel in it. 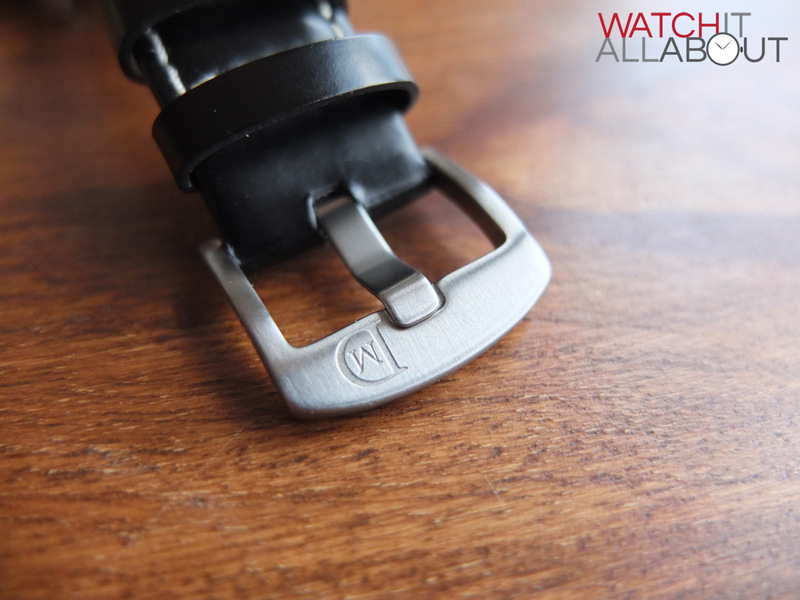 The strap has a nice thick and well machined buckle with “DM” etched into it. 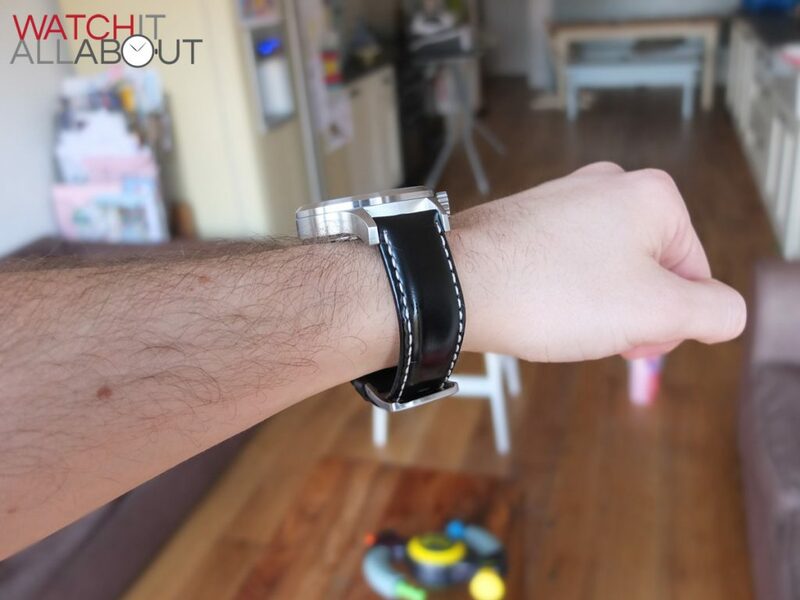 The leather strap smells a bit weird – not like leather usually does. It is also very shiny (something that you either love or hate – I’m not too fussed about it). 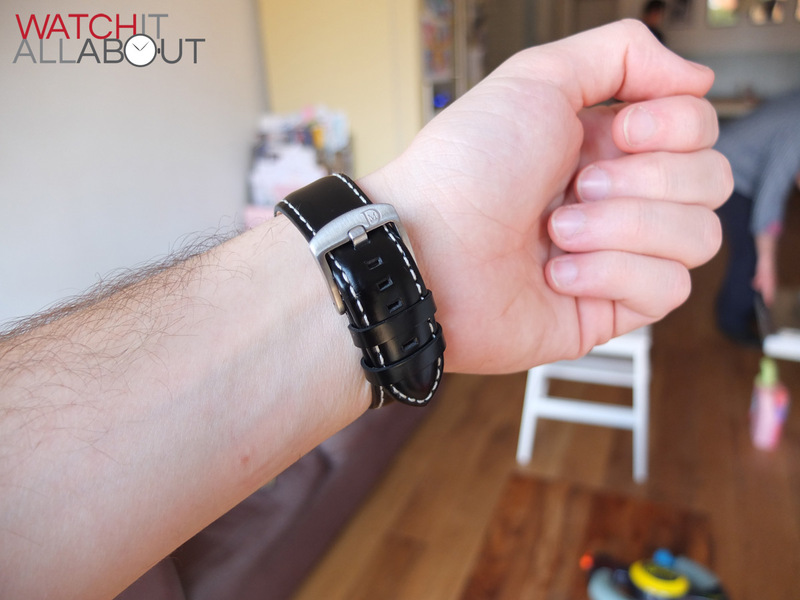 However, it is very comfortable on the wrist and has a very soft underside. 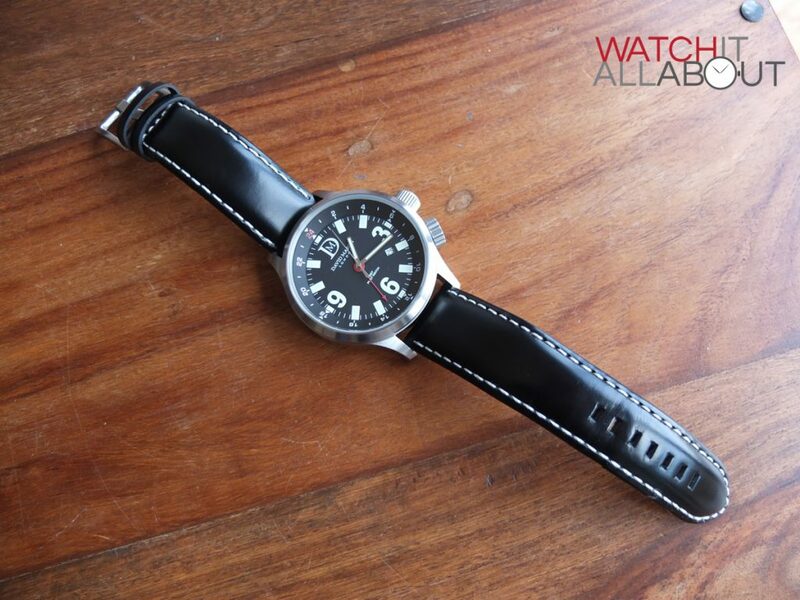 It has white stitching down both sides which match the watch face well and carry the aviation theme through. 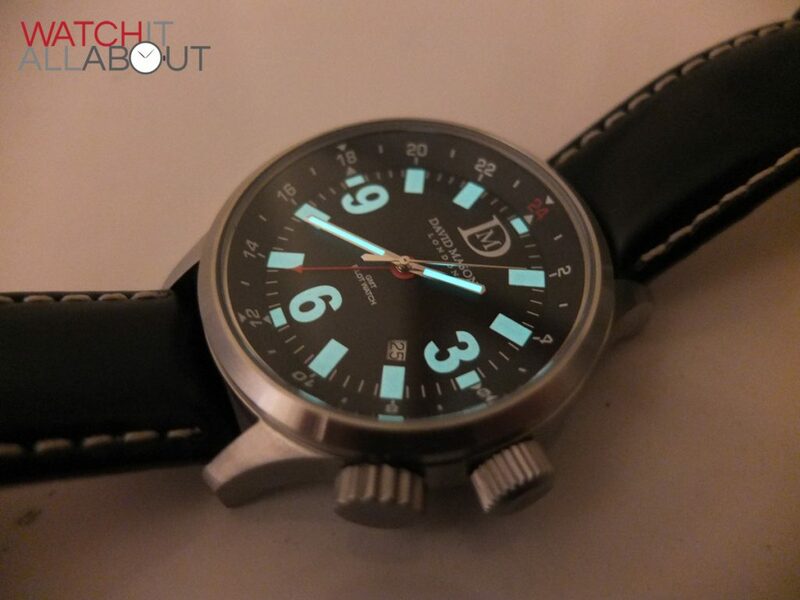 I am going to say that this watch definitely looks better in the flesh than in the majority of the pictures out there. 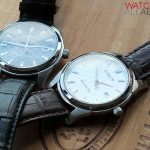 Christopher Ward tend to follow this trend too – why can some watch makers not seem to be able to take decent lifelike pictures of their watches?! 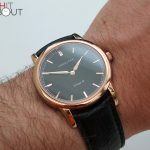 I personally think the £160 asking price is a tiny bit steep for this watch. If it had a sapphire crystal, it would be bang on. 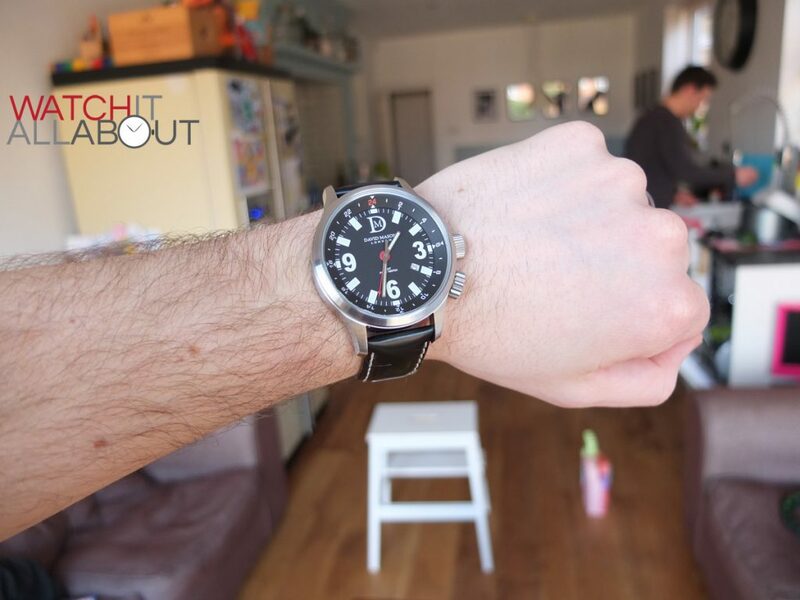 I still think though, that it is an excellent watch which feels very high quality in the hand and on the wrist. Many of my colleagues have also mentioned how nice it looks, so it gets a positive vote from the general public! 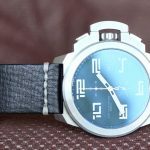 I am excited that David Mason have burst onto the watch scene, and I look forward to the new watches they will be releasing later this year. 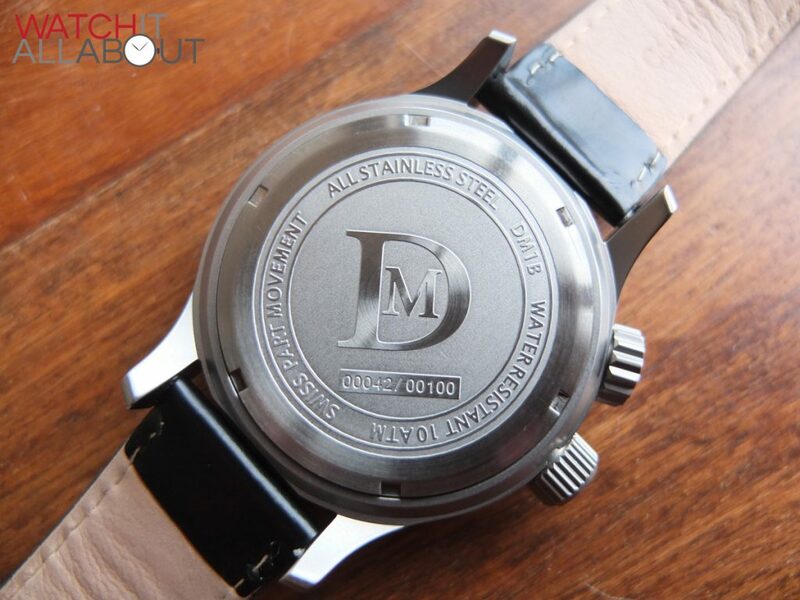 I hope all their new watches are sensibly priced and as well made as the DM1b. I really like the look if this and ‘the Quill’ from David Mason. At £160 is was tempted but cautious about buying, but recently the price has risen to £195, which has now pretty much put me off. 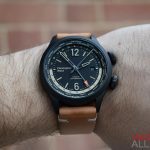 Now eagerly awaiting the other watches they have to offer especially in their racing driver line, and hope the price of those don’t put me off like I have been so far. I just ordered the Quill (white face) and looking forward to getting it. 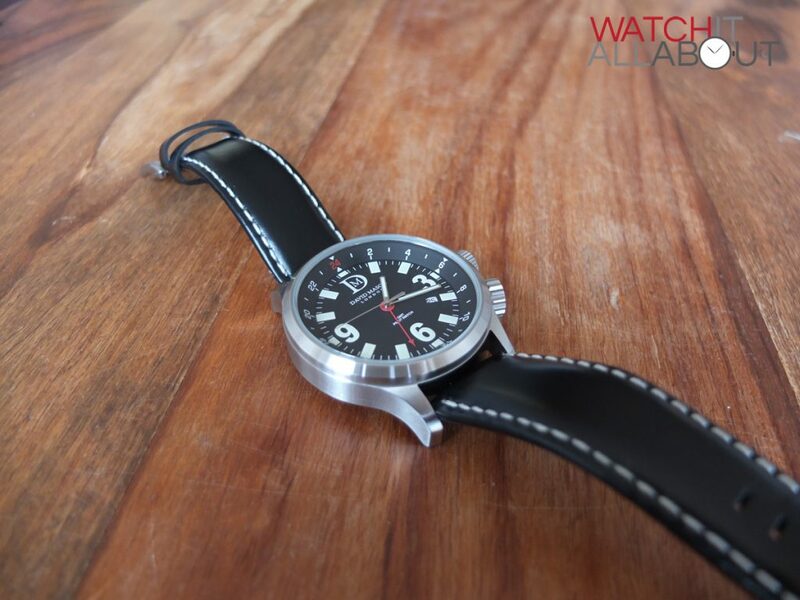 It also looks like they have a few more models in the pipeline which to my eyes also look like nice watches. 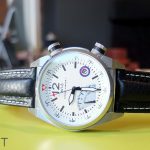 Hopefully with the uptick in interest for British made watches (Bremont etc), these guys at the lower end of the market will do well.